Apps can read or play approved content (specifically magazines, newspapers, books, audio, music, and video) that is subscribed to or purchased outside of the app. Apple will not receive any portion of the revenues for approved content that is subscribed to or purchased outside of the app. Put simply, prices no longer need to be identical outside the App Store, although publishers are still barred from providing links or buttons that lead to external pages where subscriptions are being offered. In all, that’s good news for the likes of Hulu, Amazon, Netflix, eBay and other companies which rely on content subscriptions. On the downside, it’s a little late for e-books publishers like BeamIt Down Software which closed down the shop, arguing it couldn’t sell books at a loss due to Apple’s 30 percent cut on iOS subscriptions. Anyway, Apple may have just dodged an anti-trust lawsuit. That Apple is now reverting the rules of the game comes as little consolation to a five-people team of BeamIt Down Software who have invested over $1 million in cash and spent nearly eighteen months developing the iFlow Reader app. The company ceased operations on May 31 and is no longer providing support or updates for the reader app. “They screwed us”, BeamItDown Software’s Philip Huber told Fortune. Perhaps they could now make their case in court and seek damages over lost profits? Apple launched iOS subscriptions with NewsCorp’s iPad-exclusive digital newspaper, The Daily, causing divide among big magazine and newspaper publishers. Some, like Hearst and Bloomberg Businessweek bent over to Apple and its strict iOS subscriptions requirements that were to go into effect as of June 30. 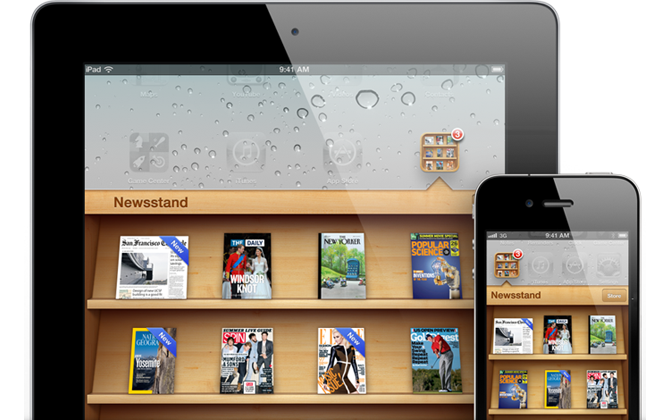 Others prominent publishers like Time, Inc. have refused to offer iPad magazines with in-app subscriptions altogether unless Apple comes to its senses. Forward-thinking publications like Fortune and Financial Times have snubbed iOS subscriptions with HTML-based web apps. With Apple’s change in stance and iOS 5 Newsstand (pitched as the iBooks for digital magazines and newspapers), publishers and Apple finally find themselves on the same page.